Organisational culture, we all know, eats strategy for breakfast. It’s also been known to snack on policies and regulations, even on leadership. If your organisation’s culture is toxic, parachuting in a new leader can only do so much to fix the problems. But if your culture is healthy and positive, you can achieve great things. Right now we’re seeing evidence of cultural failure behind many of the crises facing banks, political parties, government agencies, statutory authorities, big companies, schools, police, emergency services, sporting clubs, and any number of big and small companies. The symptoms and results of cultural failure include unchecked bullying, sexual harassment, discrimination, unsafe work practices, fraud and exploitation. We’re here to help you build a healthy, positive culture, because we know a positive culture can drive greater productivity, collaboration, success in achieving goals, and satisfaction among members, workers and board members alike. 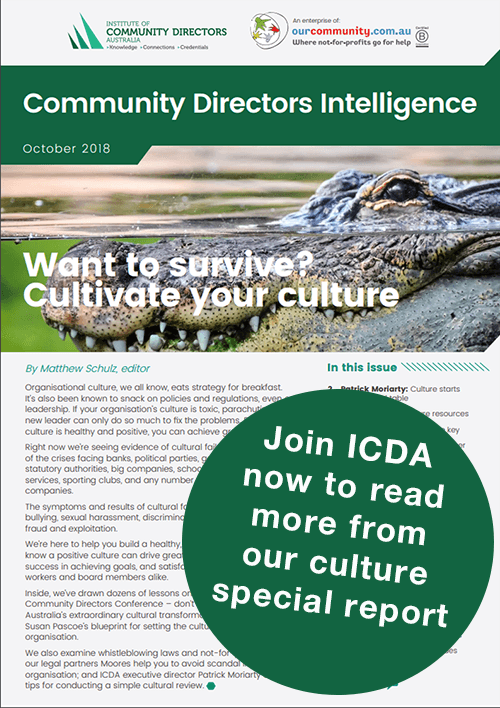 Based on a special edition of Community Directors Intelligence, we’ve drawn dozens of lessons on culture from the 2018 Community Directors Conference. We also examine whistleblowing laws and not-for-profit training; help you to avoid scandal in your organisation; and offers tips for conducting a simple cultural review. Video essay: What culture will you lead?